May 17, 2014 – Libya has been steadily deteriorating politically and economically since the US-NATO invasion of 2011. The South African based News24 reported that a battle had erupted between rebel forces that ousted President Muammar Gaddafi and Islamist militants in the eastern city of Benghazi. Khalifa Haftar (who helped the West remove Gaddafi) and his ‘National Army’ were seeking to “Purge” Libya of suspected terrorists. There were witnesses and even a reporter from the Agence-France Presse (AFP) who actually saw what happened at the scene. “Haftar’s group calls itself the “National Army” and a spokesperson for the force, Mohammed Al-Hijazi, told a local broadcaster it has launched “a large-scale operation to flush terrorist groups out of Benghazi”. So who does Khalifa Haftar represent? “In a statement on national television, Salihin called on “the army and revolutionaries to oppose any armed group that tries to control Benghazi by force of arms”. 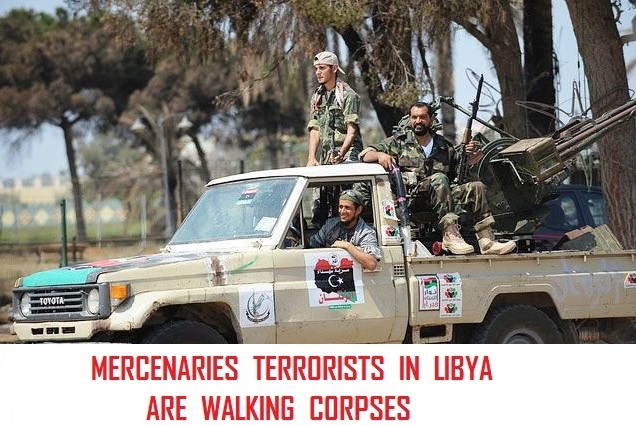 It confirms that Libya is in a chaotic situation. Many former soldiers have joined the ‘National Army’ after constant attacks by various militias and elements of Al-Qaeda since the US-NATO invasion had ended. The Libyan government currently in power has seen constant violence against its security forces, government officials and even foreigners since the Obama administration ordered “regime change” in the North African country. The Libyan people have been the victims of Western Imperial powers that sought control over oil supplies and other resources. The European Union should also be concerned that terrorists can launch attacks against its member states as former Libyan Prime Minister Ali Zeidan had warned last month in a report by Al Arabiya News. What would happen if a terrorist attack did occur on European territory, especially when its economy is in decline? With austerity measures imposed on millions of working class people all across Europe, a terrorist attack by al-Qaeda or its affiliates would allow European governments to clamp down on anti-austerity protests in the name of fighting terror. It would be a convenient excuse to do so. Let’s hope it does not go that far. Rising tensions between the Libyan government, terrorist organizations and local militias has Washington, Brussels and multinational oil corporations concerned. If the Libyan government were to lose control of the oilfields, it would disrupt the EU’s oil supply and raise prices at the pump. The US and EU’s decision to remove Muammar Gaddafi has created a terrorist haven in North Africa. However, Brussels is under Washington’s orders, so NATO forces invaded Libya and imposed a new government even though European bureaucrats knew about the political and economic consequences it might have in the future. Since the US-NATO alliance defeated Libyan forces and replaced Gaddafi with the National Transitional Council of Libya, they secured oil exports for Western markets at least for a short period of time. Now internal conflicts for power and economic control are becoming more intense as former rebels and various terrorist groups from Syria and Iraq enter Libya with their own agendas. It creates a dangerous scenario as terrorist organizations expand their operations to other areas of Africa and even possibly Europe. Brussels obviously knew that there would be consequences of a “humanitarian intervention” in Libya when they collaborated with Washington. They knew how Europe would be affected in the foreseeable future, it was predictable. But they saw political and economic opportunities by removing Gaddafi from power. It is also important to understand that the US and its European partners were also concerned with Gaddafi’s plan to launch the gold dinar as a single African currency, a clear threat against the dollar and euro hegemony on the African continent. Brussels may be just following orders, after all Washington was instrumental in the creation of NATO in the first place. Either way, the people on both sides of the Mediterranean Sea will suffer at the expense of Western Imperialism and their reckless foreign policies. This entry was posted in Bengasi, Bengazi, Benghazi, Crimes against humanity, Libyan terrorirts, NATO-bombings, Nato-mercenaries, NATO-war-crimes and tagged Bengasi, Bengazi, Benghazi, crimes against humanity, Libya, LibyanFreePress, Mercenaries, Nato, NATO-bombings, Nato-mercenaries, NATO-war-crimes, War Crimes. Bookmark the permalink. Why isn’t Obama going to war in Libya to help prevent civilian massacres again? Wasn’t that his reason the first time?